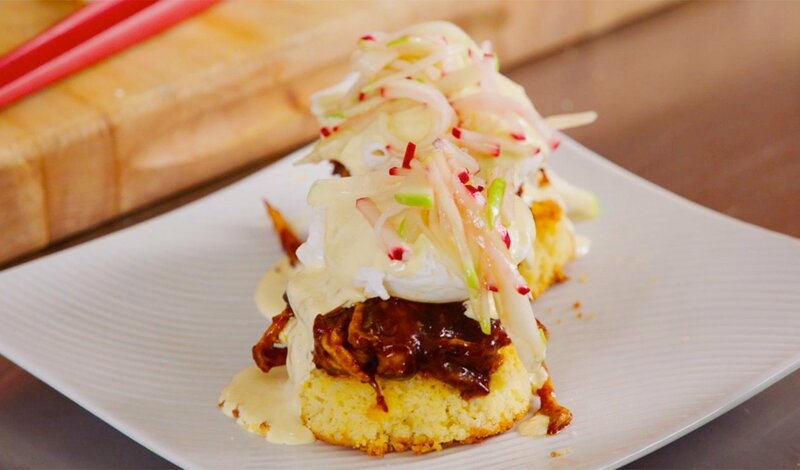 A Southern twist on a classic, this eggs benedict is served over cornbread rounds and topped with flavorful braised pork and a bright apple slaw. Season pork generously with salt and pepper. Heat a small rondeau over high heat, add oil and sear the pork until browned on all sides. Add the remaining ingredients. Bring to a boil. Cover the pot and transfer to a 300F oven. Cook for 2-1/2 hours or until fork tender. Remove the meat and reduce the braising liquid by half. Shred the pork and return the meat to the liquid. Set aside. Reduce the bourbon by half in a small saucepot. Add the Knorr® Liquid Hollandaise and maple syrup. Heat and keep warm. Combine all ingredients in a small bowl and refrigerate until ready to use. Placetwo warmed cornbread rounds on a plate. Top each with 2 oz of the pulled pork. Top each with a poached egg. Pour the prepared Bourbon Hollandaise sauce on top, garnish with a small amount of the apple slaw and serve.